Once you get the hang of this recipe, you’ll be changing it up with your favorite vegetables. Use it for ‘clean out the fridge night’ (using up all your leftover veggies). Use it after trips to the farmers market or when summer CSA’s & gardens become bountiful in delicious veggies. 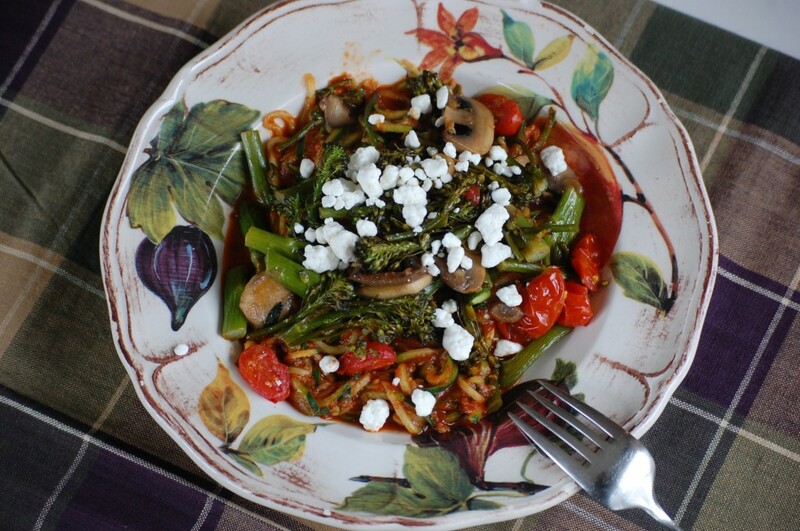 For a vegan option, substitute the goat cheese with toasted pine nuts. Preheat oven to 425 degrees. Coat a baking sheet with 1 T olive oil. Prepare your roasting veggies: trim ends of broccolini & asparagus and chop into thirds, halve the cherry tomatoes and slice the mushrooms. 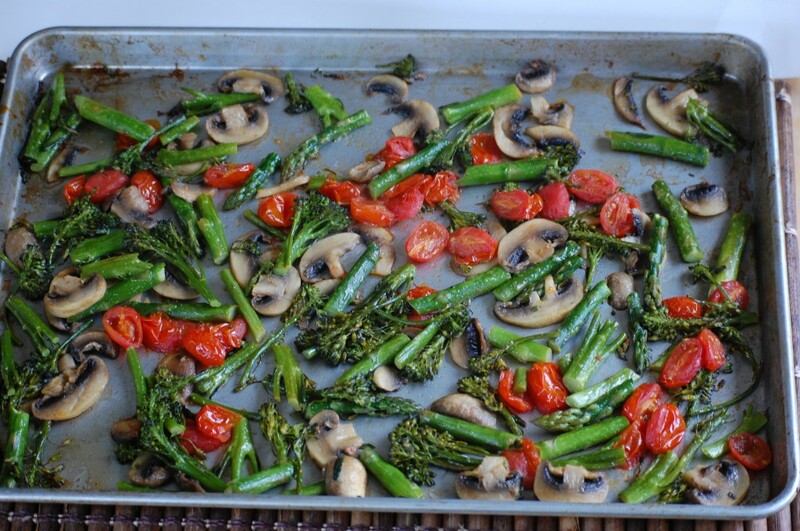 Place broccolini, asparagus, mushrooms & tomatoes on baking sheet. Toss to coat with oil. Bake for 15 minutes. Stir and bake another 5 minutes. While veggies are roasting, wash, trim and spiralize your zucchini. Sprinkle with 1/2 teaspoon of sea salt and then blot excess water off with paper towel. 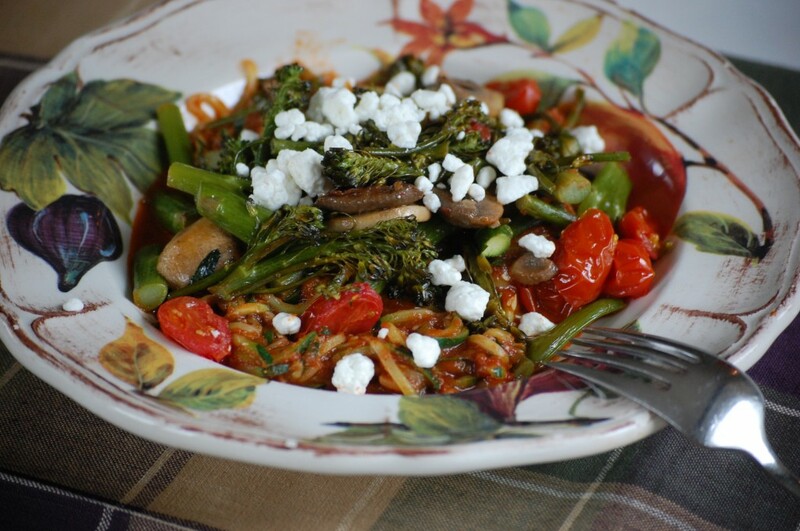 In a large saute pan over medium high heat, sauté the spiralized zucchini for 4-5 minutes. 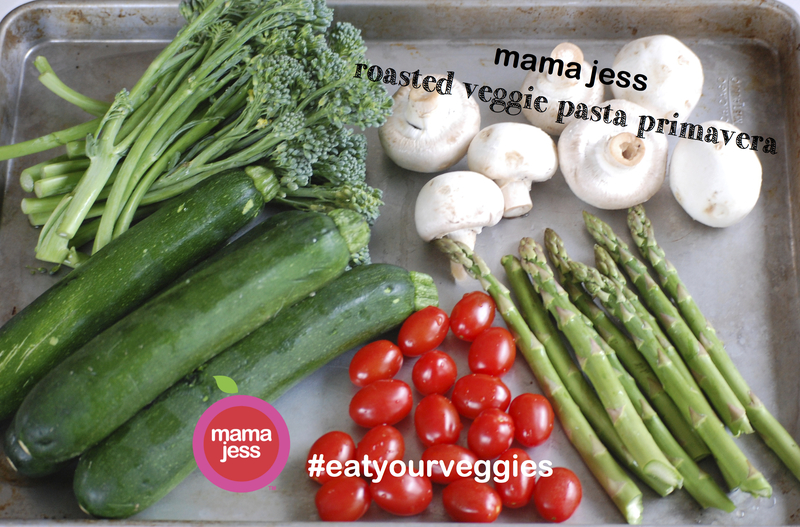 Add the Mama Jess Garden Good pasta sauce and stir to heat through. Add a scoop of pasta to each plate, top with 1 cup of roasted veggies and a sprinkle of goat cheese. Serve immediately and enjoy, enjoy, enjoy!